MIAMI -- All her life, 20-year-old Sarah Colón imagined she would always live in Puerto Rico. But after Hurricane Maria demolished the island, making her house uninhabitable and putting her college education on pause, she is making Miami her permanent residence. Colón, who was a junior at the University of Puerto Rico in Rio Piedras, knew she would have to leave in order to finish her degree on time. Everything in her house was damaged with the floodwaters. She is now enrolled at Florida International University, which has waived out-of -state tuition fees for students from Puerto Rico and the U.S. Virgin Islands. Since the hurricane tore through the island over one month ago, the flow of people like Colón to the mainland has not let up. There are constant newcomers to Florida, New York, and Chicago where there are heavy concentrations of Puerto Ricans from past migration waves. Florida, which is already home to over 1 million Puerto Ricans, has had an influx of 67,000 more since the storm hit, according to Florida Gov. Rick Scott’s office. There are different estimates on the total amount of Puerto Ricans expected, ranging from 250,000 to nearly 1 million. Before the hurricane hit, Puerto Ricans were already flocking to the mainland – as many as 1,000 families per month – because of the financial crisis that has gripped the island. Undoubtedly, Puerto Rico is seeing a mass migration like none other. “Puerto Rico will be seen by historians as before and after Maria,” said Martínez Fernández, who called it a watershed moment. To find a time in history with a major moment of disruption like this, he said, one would have to go back to the conquest of the island by the Spaniards centuries ago. For some Puerto Ricans, the stay is temporary until Puerto Rico fully restores power and drinking water. Puerto Rico’s Gov. Ricardo Roselló has promised 95 percent of the island will have power by Christmas. Nonetheless, it’s impossible to determine how many Puerto Ricans will remain permanently. “I think it will depend on how quickly basic services can be restored - electrical power, running water, and transportation," said Florida International University professor Jorge Duany, who authored the book Puerto Rico: What Everyone Needs to Know. A $36.5 billion disaster relief package approved by the Senate Tuesday now awaits President Donald Trump's signature. The package, provides money for the Federal Emergency Management Agency, (FEMA), the national flood insurance program, recovery from wildfires in the West and $1 billion for nutrition assistance for low-income Puerto Ricans. It also makes available $4.9 billion in federal loan money to help cash-strapped Puerto Rico. Martínez Fernández calculates that at least 75 percent of Puerto Ricans will stay on the mainland. “Even though they may want to go back, they won’t be able to because of the unemployment crisis that they’re going to find there,” he said. Melissa Nogueras arrived in Miami one week ago with her mother and three children ages, 9, 10, and 14 and plans to rebuild her life here. Everything inside the home they left behind in the central mountain town of Cayey was damaged by the floodwaters, including their clothes and the mattresses. 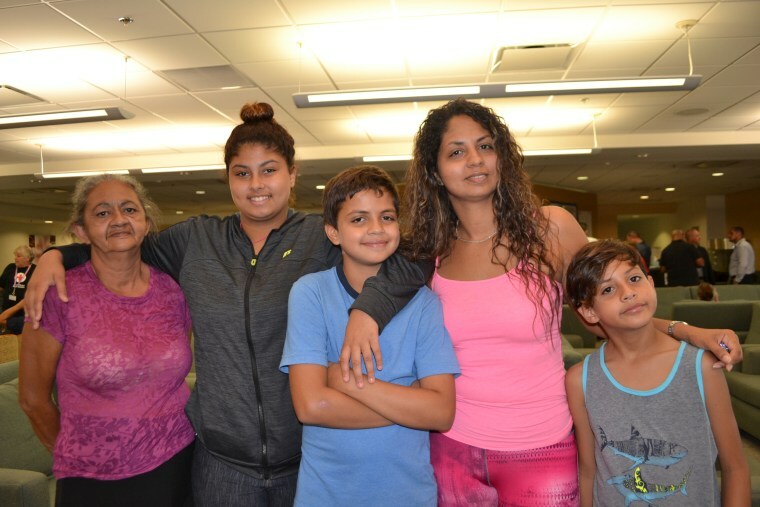 She and her family were recently taking advantage of the disaster relief center at Miami International Airport, which the state set up so Puerto Ricans can seek assistance from organizations like the Salvation Army and Red Cross, as well as government agencies such as the Department of Children and Family Services. Similar centers were set up in Orlando and Tampa. So far, over 12,000 people have used these services since they were set up three weeks ago. Nogueras’ primary decision to leave Puerto Rico was her children. She was afraid for their health. “There is dark water outside the house that smells bad and all the garbage is still there. I’m afraid of bacteria,” she said. Noguera described “kilometric lines” to buy food and said a bag of ice was costing $10. “The kids were getting desperate,” she said. For now, the family is staying with Nogueras‘ brother. The children are already enrolled in Miami schools. The Florida Department of Education has temporarily waived rules so public schools can enroll kids whose education records are unavailable due to the storm. Numerous colleges and universities across the state have waived out-of-state tuition fees for displaced students. Nogueras never thought about moving to Florida before the hurricane. She thinks it will take years for Puerto Rico to be the way it was before the storm. “I don’t like how Puerto Rico looks," said Nogueras. "It’s very depressing." Carmen Sesin is a reporter based in Miami.